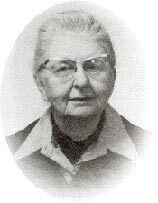 Florabel Condy was an energetic and dedicated member of many local groups – Women’s Art Association, Head-of-the-Lake Historical Society, IODE, Women’s Canadian Club and the Art Galleryof Hamilton, to name a few. She was also an avid traveler and student; detailed notes from all the Couchiching Conferences she had attended, for example were discovered among her papers. During World War II, the federal government’s national Selective Service took Miss Condy from her accounting position in a glass firm and made her responsible for placing disabled women in suitable jobs – an assignment of which she was very proud. Later, she became Director of Public Relations for Amity. She was a native Hamiltonian, having descended from a Scottish family, which had settled in 1842 in Bartonville, a community along King Street East in the Rosedale-Cochrane Road area. When Miss Condy died at 92, several local organizations were notified of legacies, including the Foundation.